VW EV 2025 target: As Volkswagen Group emerges from its diesel emissions scandal and faces increasingly strict government mandates on reducing vehicle carbon emissions, the German automaker expects electric vehicle sales to increase substantially by 2025. 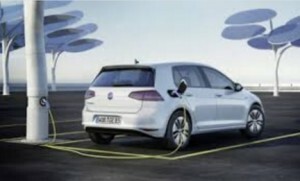 VW says it will have to sell about one million battery electric and plug-in hybrid vehicle per year by that year. VW projected that volume by analyzing regulatory environments in key markets, including draft legislation in China. That will require a huge leap from where VW stands right now in EV sales. Total cumulative volumes of all VW brand electrified cars (including VW, Audi, and Porsche) sold since the start is expected to be about 103,000 by the end of this year. For the first four months of 2016, the company sold just shy of 3,000 EV units in the U.S. with the Audi A3 Plug In, VW e-Golf, and Porsche Cayenne S E-Hybrid, according to HybridCar’s Dashboard. Green bonds: Automakers are taking the green bond market very seriously with $2.5 billion raised in 2016 to finance electric and hybrid vehicles. In May, Toyota’s financial arm sold a $1.6 billion green bond to fund consumer purchases and leases of energy-efficient Toyota and Lexus vehicles; that was upsized from an earlier plan to sell $1.2 billion in green bonds. Chinese automaker Zhejiang Geely Holding Group raised $400 million this month in a green bond sale to finance development of zero-emission black cabs in the U.K. The bond was close to six times oversubscribed. Other automakers are likely to come to market with green bonds, said Stephen Liberatore, a portfolio manager at TIAA. Libatore’s TIAA-CREF Social Choice Bond Fund holds about $75 million of Toyota’s green bonds. 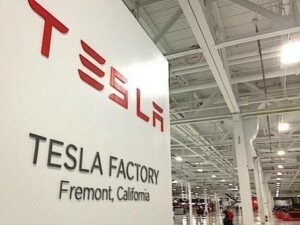 Gigafactory tour: Tesla Motors will be opening the doors on its “Gigafactory” to the general public on July 29. The 130-acre battery-making plant isn’t due to start production on lithium ion cells until 2017. The date was revealed in email sent to customers, who won invitations to the customer-focused event by referring customers via Tesla’s referral program. Although only about 15% finished as of early May, the factory is already producing Tesla’s Powerpacks and Powerwalls. 2017 Fusion Energi mpg: Ford has been promoting its Fusion Energi as the plug-in hybrid with the longest range out there on battery and gasoline engine. The 2017 Fusion Energi does get a few improvements including getting 42 mpg over 38 the previous year; 97 MPGe over 88 last year; and 22 miles “Elec+Gas” range, over 20 miles for 2016. Its total driving range extended from 550 miles to 610. Hydrogen stations: Leading hydrogen station supplier FirstElement has 13 True Zero stations in operation now, mostly in the Los Angeles and San Francisco Bay areas. The company hopes to have the rest of the 19 done by early next year. That would give True Zero a dominant share of the market in California; there are just six other retail hydrogen stations not owned by the company. Lithium ion batteries: Popular Mechanics just published an educational article titled, “5 Things To Know About Making Electric Car Batteries Better.” Having tried out a radio-controlled Yeti Trophy Truck with a lithium battery, writer Ezra Dyer researched and answered a few questions. For one thing, the term lithium-polymer “is a reference to the packaging material, which is a polymer aluminum laminate. The inside is still lithium-ion, but the complete battery is dramatically different compared with a production electric car’s lithium-ion battery.” As far as all the advanced batteries being tested out in r&d centers, Dyer thinks that lithium-ion is the winner for now. Carsharing report: According to Navigant Research, global carsharing services revenue is expected to grow from $1.1 billion in 2015 to $6.5 billion in 2024. Growth in one-way carsharing services is prompting more companies to consider offering this service model. Utilization of the vehicles has improved as carsharing members can use one-way carsharing for shorter, spur of the moment trips. Adoption of plug-in electric vehicles (PEVs) in carsharing services is expected to increase as automakers promote this technology. Trump on biofuels and oil: Donald Trump has a plan for “complete American energy independence” in his campaign for president. In a recent speech, Trump said that he endorses repealing President Obama’s climate regulations, gaining independence from OPEC oil, and “canceling” the COP21 agreement. Trump would also like to “remove obstacles” to increased oil and gas development in the US. He does support the Renewable Fuel Standard (RFS) and ethanol production. Biofuel group Growth Energy says that both Trump and Hilary Clinton support the RFS. Start-stop: General Motors will be offering start-stop systems on at least one powertrain in every model it manufactures and sells by 2020. It comes from pressure to increase fuel efficiency in its fleets and because of advances in hardware. Starting with the 2017 model year, the U.S Environmental Protection Agency will award credits toward compliance with fuel economy standards to automakers who equip vehicles with start-stop systems. Have you ever taken an Uber ride to the airport, work, concert, or out on a date? Not only have I taken a few Uber rides, I’ve put in quite a few hours and miles on the road as an Uber driver. I’ve also written a non-fiction book about it that was published Friday on Kindle, Tales of UberMan: An auto journalist shares his Prius with savvy riders. As some of you reading this newsletter may remember from five years ago, I wrote a feature about another driving gig I was doing for side income. I’d been a chauffeur on weekends for a company called Econation, taking people to LAX in a Toyota Prius or a natural-gas powered Town Car. In Tales of UberMan, I bring a broad perspective on the battle between the taxi and limo industry versus Uber and other ridesharing companies. Uber is taking business away from traditional vehicle-for-hire services – and bringing confrontation and debate to court rooms, city councils, airports, and state governments. 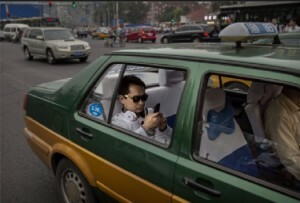 Uber is becoming a bad word for taxi drivers and other businesses losing ridership. It’s also raising the flag on whether Uber should be doing more extensive background checks to avoid catastrophes like the Uber driver, in February 2016, killing six people in Kalamazoo, Mich., in between Uber rides. The word “Uber” is becoming pervasive and omnipresent all over the media and internet – similar to “Elon Musk” and “Tesla” in cleantech and automotive. Riders might say they’re going to be “Ubering” across town to hang out with friends on a Saturday night. This month, a parody trailer has been streaming on the internet suggesting that a sequel to the 2011 film, “Drive” starring Ryan Gosling had been released. 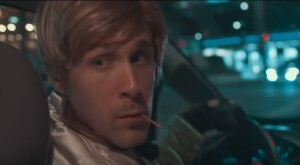 In the humorous video, a look-alike comedian portrays Gosling driving for Uber in the sequel, “Drive 2: The Uber Years.” He has to deal with working for less than minimum wage and cleaning up after vomiting passengers. (The photo used in this article comes from the trailer on YouTube.) My experience has been making a bit more than minimum wage, and having a near-miss with a drunk passenger nearly vomiting in my Prius. Uber is becoming so pervasive as to inspire this parody video – and to be commonly mentioned by stand-up comedians, on TV shows, and in conversations people are having with friends and colleagues. Automakers predict that within the next 10-to-20 years, the auto industry will look completely different as OEMs become mobility service providers. General Motors has made some big moves in the direction this year, and has nudged competitors in that direction. In January 2016, GM announced a $500 million investment in Lyft and acquisition of the technology and most of the assets of Sidecar Technologies Inc. Sidecar had been the third largest ridesharing firm after Uber and Lyft. Before the end of that month, GM announced the launch of Maven, a “personal mobility” brand. Within months, other automakers moved forward to break into the mobility marketplace. In late May 2016, Toyota and Uber announced a funding program for drivers. The Japanese automaker began offering new leasing options in which car purchasers could lease their vehicles from Toyota Financial Services and cover their payments through earnings generated as Uber drivers. At that same time, German carmaker Volkswagen announced a $300-million investment in Uber rival Gett, a service that is available in 60 cities and connects passengers with taxis and black town cars. In another move, BMW AG said its BMW iVentures venture capital arm had invested in California-based Scoop Technologies, which offers a smartphone-powered carpooling service called Scoop. Automakers typically announce new investments in the future of mobility, eventually integrating autonomous vehicles into their new vehicle lineups. GM and Lyft will be testing out autonomous vehicles soon utilizing the all-electric Chevy Bolt. Tech giants Apple and Google are investing in these new technologies as well. I typically see a strong correlation between autonomous, electrified vehicles and mobility services like ridesharing, carpooling, and carsharing shaping the future of transportation. In my new book, I wrote about being 52 years old and typically driving Millennials (18 to 35) around L.A. and Orange counties. Uber is cool for Millennials, who enjoy paying only about half as much for an Uber ride as they would for a cab ride; they also like that they can do everything on their smart phone and have the driver show up within five minutes once the trip is started. This book explores the revolutionary impact that Uber (and other ridesharing companies such as Lyft) will likely have on transportation in the future – where young consumers are putting off getting their drivers licenses and buying a car and would prefer to take Uber, ride their bike, take bus or rail, or to try out Airbnb, Zipcar, and other mobile services in the “sharing economy.” As cities become more popular to live in, and increasingly more crowded and congested with traffic, Uber is rapidly growing in ridership and its ubiquitous brand name. Many Uber riders and drivers are proud to be part of it, and think it’s critical for reducing traffic congestion and air pollution. The title of the book came from the “UberMan” nickname that my girlfriend, Susan, started calling me last year after me sharing yet another colorful story from an Uber ride; and that I should write a book about it. A few days later while telling a passenger about it during a ride from an airport, the title Tales of UberMan was suggested. I started driving for Uber in early May 2015, and since then have put in a few hours also driving for Lyft and on-demand food delivery company, Postmates. The book was written from my own experience, and perspectives gained through interviews with Uber drivers and passengers. It’s challenging to be an Uber driver and use your own car as it builds up wear and tear, and the driver pays for everything. Drivers, also known as Uber Partners, need to put in several hours each week for the payback to show up – at least 15 hours and usually much more. Than can mean working late into the evening and early morning hours on weekends, as passengers leave bars and parties and don’t want to get a DUI. There’s always the threat of having to pay for traffic citations, increased insurance, parking, toll roads, and damage to their car. Uber prides itself on a partnership with Mothers Against Drunk Driving (MADD) to take a few drinkers out of driver’s seats – and for alleviating some of the traffic congestion and air pollution in fast-growing cities around the world. Through UberPool, the company strives to make ridesharing a common experience. Uber drivers tend to take pride in bringing cost effective, convenient transportation to riders – and for having flexibility and decision making in their work. They decide when they’re ready to go online and start driving, and when it’s time to turn it off and go home. Tales of UberMan offers a mix of colorful stories on what happened during trips, blended with a look at the global issues behind Uber becoming the buzzword for ridesharing services. One of the book’s chapters contemplates whether Uber and one of its major investors, Google, will partner on creating a fleet of self-driving cars in the near future. It seems like every day, there’s media coverage of a controversy, victory, or business deal with Uber at the very center of it. For now, Tales of UberMan is available as a Kindle e-book. Later on, I will release a print-on-demand version through Amazon’s CreateSpace, and an audio version through Amazon’s Audiobook Creation Exchange (ACX). Tesla taking heat over immigrant worker and supplier relations: Tesla Motors has been facing challenges lately on the vehicle manufacturing front; one of these controversies comes from a Slovenian electrician named Gregor Lesnik working at the Tesla plant in Fremont, Calif., falling through the roof in May 2015 and suffering broken bones in his legs and ribs and head injuries, including a concussion. Lesnik survived and sued his employers, as reported last week in a San Jose Mercury News’ watchdog report. He’d entered the U.S. in March 2015 with a B1/B2 visa on behalf of his employer, ISM Vuzem, as a supervisor of electrical and mechanical installation. He was going to work in a paint shop at a South Carolina BMW plant but instead was diverted to the Tesla plant to install an industrial heating and cooling system, something his visa did not allow him to do. The lawsuit and media report raised the flag on exploiting immigrant workers and committing fraud; and if the federal government should be watching more carefully. Lesnik alleged in his suit that although his hourly rate was over $10 an hour, it averaged out to a little over $5 an hour, far below minimum wage, because he wasn’t paid overtime for weeks that often reached 80 hours. The same work by a local employee would have cost more than $50 an hour. Tesla CEO Elon Musk has denied wrongdoing and said his company is auditing the contracts to see if its contractors met wage obligations……. That news story came days after Reuters reported on concerns raised by analysts and supplier executives who asked not to be identified that Tesla’s plan to manufacture 500,000 electric vehicles per year by 2018 has been called into question by several sources close to the issues. Tesla’s ambitious plan has called for moving up high-volume Model 3 production two years earlier than originally projected, which they claim will be very difficult and costly. Larger automakers have had to adjust production volumes to lower levels per year at assembly plants to realistically hit their targets. Tesla continues to have delivery delays for its Model X crossover, and its Model S also missed delivery targets when launched and that’s likely to continue with the Model 3, they say. Tesla says that orders and deposits for the Model 3 have been reduced to 373,000 following cancellations of about 8,000 cars and 4,200 duplicates canceled by the company. As capital intensive as auto manufacturing can be, Tesla also announced last week plans to sell about $2 billion in stock to help finance the accelerated launch of the Model 3. The 29th World Electric Vehicle Symposium and Exhibition (EVS29) event organizers have announced more keynote plenary speakers for day two of the event. Dan Neil, Pulitzer Prize winning auto columnist from the Wall Street Journal, will sit down with industry leaders to talk electric drive innovation and automaker strategies for scaling success during a robust roundtable discussion. Roundtable participants include: Christoph Huss, Vice President Engineering, BMW of North America; Kazuo Yajima, Alliance Global Director, EV and Engineering Division, Nissan and Renault; Kevin Layden, Electrification Programs and Engineering Director, Ford Motor Company; and Michael Lord, Executive Engineer, Toyota Motor Engineer & Manufacturing. The EVS29 conference takes place June 19-22, 2016 in Montréal, Québec, Canada. Register now and gain access to the entire electric drive value chain under one roof. SAE International approved for publishing “SAE TIR J2954 Wireless Power Transfer for Light-Duty Plug-In/ Electric Vehicles and Alignment Methodology,” a guideline to establish wireless power transfer between infrastructure, vehicle suppliers and OEMs for plug-in electric and electric vehicles (PH/EV). The document will be available from the SAE website on May 31st. SAE TIR J2954 is the first step in standardization and was developed by SAE International’s PH/EV Wireless Power Transfer committee, established in 2010. Jesse Schneider serves as the Chair of SAE International’s Wireless Power Transfer committee and is the Fuel Cell, Electric Vehicle and Standards Development Manager at BMW North America. AltCar Expo: Oakland hosted the third annual Northern California AltCar Expo on May 20-21. Toyota, Mercedes-Benz, General Motors and Nissan showcased hydrogen fuel cell cars, electric vehicles, hybrids, and natural gas vehicles, and renewable diesel vehicles. Attendees were able to test drive the vehicles for free both days. Keynote speakers included Richard Battersby, Equipment Manager and Director, City of Oakland and East Bay Clean Cities Coalition; Peter Van Deventer, Program Director & Diplomatic Liaison, Coast to Coast EV Connection and Consulate General of the Netherlands; John Kato, Deputy Director, Fuels and Transportation Division, California Energy Commission; David Meisel, Senior Director, Transportation & Aviation Services, Pacific Gas & Electric Company; Tim Lipman, Ph.D, Co-Director, Transportation Sustainability Research Center, UC Berkeley; and Rick Sikes, Chief Operations Officer, carbonBLU. Mercedes-Benz will likely be launching two electric sedans and two SUVs by 2020. They may be plug-in hybrid, battery electric or both, and are being built with minimal changes from the internal combustion engine models. The electric SUVs may be built on the Mercedes GLA and GLC platforms, and the electric sedans could come from the C-Class and S-Class platforms. Going this route could give the company the opportunity of pricing these EVs lower than the Tesla Model S and Model X.
Volvo will be rolling out its new 40 series compact cars and SUVs, including a plug-in hybrid and an electric car, starting in spring 2018 in the U.S. Details on plug-in hybrid and all-electric variants of the 40 series haven’t been released yet.Last year, Volvo released its new “global electrification strategy,” which will include new plug-in versions of its cars, SUVs, and wagons. xStorage battery packs: Nissan, through its U.K. division, is following Tesla’s lead by entering the energy storage market. Available for pre-order in September, the xStorage line of battery packs was developed with power-management company Eaton. The partnership between Nissan and Enel SpA, Italy’s largest utility, will let Nissan Leaf and e-NV200 owners sell excess energy back to the grid. Owners can sell energy from their lithium-ion batteries during periods of peak demand to the utility. Self-driving car survey: The University of Michigan Sustainable Worldwide Transportation conducted its second annual survey on self-driving vehicles – and found that Americans might tend to agree more with the California DMV’s suggested policy than with Google’s argument for owning completely autonomous vehicles. The survey yielded completed responses from 618 licensed drivers in the U.S. and found that the most frequent preference for vehicle automation continues to be for no self-driving capability, followed by partially self-driving vehicles, with completely self-driving vehicles being the least preferred choice. Respondents still overwhelmingly want to be able to manually control completely self-driving vehicles when desired. ACT Expo highlights: Check out the photo gallery, conference program, and event summary for ACT Expo 2016, which just took place in Long Beach, Calif. Set for May 1-4, ACT Expo 2017 will return to the Long Beach Convention Center. Event organizer Gladstein Neandross & Associates will be presenting Rethink Methane Symposium 2016 in Sacramento, Calif., on June 29-30, 2016. Developing a strategy to handle the demands of increasingly connected vehicles, driver assistance systems, and the need to develop autonomous technology. Last October after reorganizing management, VW announced its Modular Electrification Toolkit, a standardized technical model for developing plug-in electric vehicles within the Volkswagen Group. The focus is on plug-in hybrids with an even greater range, high-volume electric vehicles with a range of up to 300 kilometers (186.4 miles) and eventually to 500 kilometers (310.7 miles), a 48-volt power supply system (mild hybrid), along with more efficient diesel, gasoline, and CNG concepts. It’s all part of what VW earlier announced as its Modular Transverse Toolkit. In late April, Mueller gave a presentation on the company’s 2015 annual financial statements. 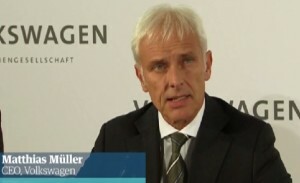 He reiterated plans to launch over 20 additional ‘e-vehicles’ by 2020, as VW pushes ahead with developing its bespoke architecture in the form of its Modular Electrification Toolkit. The first vehicles produced on the MEB module are slated to hit the streets at the end of the decade. “We plan to make electric cars one of Volkswagen’s new hallmarks,” Mueller said. VW will be shifting its strategy to profitability, not sales volume. Being No. 1 in global sales won’t be its top priority anymore. It will mean limiting the number of volumes its builds and sales, and using its own resources more efficiently. It will also ties into what other automakers like BMW, Daimler, Ford, General Motors, and Toyota have been experimenting with lately: testing out business ventures focused on mobility services and new technologies: carsharing, ridesharing and ride-hailing, delivery services, autonomous vehicles, vehicle electrification, and urban commuter cars. VW’s investment resources for mobility and electrification will be limited by the vehicle recall. The company said that it lost 16.2 billion euros ($18.2 billion) for 2015 alone once the diesel scandal was revealed last September, and that’s likely only a part of the total cost. Maven is rolling out to cities as GM’s hourly carsharing/car rental service expands its Ann Arbor, Mich., operations and moves over to Chicago, New York, Washington, D.C., and Boston. In its Ann Arbor office, prices for renters range from $6 an hour for the Chevrolet Spark and Volt, to $12 an hour for the Tahoe; and $42 per day for the Spark and Volt, to $84 a day for the Tahoe. As part of the Maven brand expansion, certain residential buildings in Chicago, Washington, and Boston will be equipped with Maven cars for tenants to use for an hourly rate. Other Maven vehicles will be parked throughout the cities for anyone to reserve using a smartphone app developed by GM. Speaking recently at a women’s technology conference in Detroit, GM Chairman and CEO Mary Barra said carsharing services like Maven can help eliminate the headaches of car ownership in cities where congestion and parking costs are challenging. The automaker sees Maven as critical for its mobility strategy as it competes with carsharing companies like Avis Budget Group’s Zipcar and Daimler’s Car2Go and ridesharing giant Uber through its Lyft alliance. Earlier this year, GM bought a 9% stake in ride-hailing/ridesharing company Lyft Inc. for $500 million. GM working to develop a fleet of self-driving Chevrolet Bolt electric vehicles. GM and Cruise Automation, another mobility company GM recently invested in, have begun testing autonomous prototypes of the Bolt in San Francisco. Cruise Automation is providing technology for the test cars. One of GM’s goals is to launch of a fleet of autonomous self-driving taxis with Lyft within a year. Uber showed off its latest self-driving test car – a hybrid Ford Fusion outfitted with a variety of sensors and high-resolution cameras to gather mapping data and refine the vehicle’s autonomous driving capabilities. It’s being driven through Uber’s Advanced Technologies Center in Pittsburgh. Uber had previously been involved with Carnegie Mellon University and its group of experienced experts in autonomous vehicle technologies, enough to have donated $5.5 million to the department; and to hire over some of its staff for the Uber project. As of March, CMU had not worked with Uber on its self-driving car test project, according to CMU faculty and administrators. Uber recently joined a coalition that includes Google and to advocate for safety regulations for self-driving cars and help bring them to American roads. Google recently received a patent for enhancing safety features on its self-driving cars. Google’s approved patent involves coating the front of a car with adhesive for pedestrian safety. It focuses on what would happen if that self-driving car were to hit a pedestrian. Google says coating the front of a car with adhesive could prevent someone from bouncing onto the windshield, sliding under the wheels, or flying into the air and landing in the road. “The adhesion of the pedestrian to the vehicle may prevent the pedestrian from bouncing off the vehicle after the pedestrian impacts the hood,” the patent says. Colorado EV incentive: Colorado, which has long been an electric vehicle friendly state, is switching over from a formula-based tax credit to a flat $5,000 tax credit. That will shave off $12,500 from an EV’s purchase price when combined with the $7,500 federal tax credit. The state also gives the buyer the choice of trading the credit upfront off the retail price or by waiting for their next tax return. Colorado’s Southwest Energy Efficiency Project (SWEEP) says that the state tax credit can be assigned to a dealership or finance company, which takes off $5,000 from the purchase price. It’s the “best EV tax incentive in the nation,” according to SWEEP. EV sales in Europe: Renault-Nissan Alliance took 25% of plug-in electric vehicle sales in Europe during the first quarter of 2016, with the Nissan Leaf selling 6,168 units and 13.1% of the market in the No. 1 spot; and the Renault Zoe came in at 5,578 units sold and 11.9% of the share and finishing at the No. 3 spot. The Mitsubishi Outlander PHEV came in second place at 6,159 sold and nearly tying with the Leaf at 13.1% of the market. The Tesla Model S came in fourth with 3,378 units sold and 7.2% of the market share; the Volkswagen Golf GTE came in fifth with 2,979 units sold and 6.3% of the share. Overall sales of battery electric and plug-in hybrid electric vehicles were up 29% in the first quarter over the same time period in 2015. Plug-in sales made up a little bit over 1% of new vehicles sales in Europe during the first quarter, according to data compiled by the European Alternative Fuels Observatory (EAFO), a European Commission initiative to provide alternative fuels statistics and information. Audi’s EV plan: Audi says it will be introducing a new electric vehicle model every year beginning in 2018, as it races to catch-up to Tesla and other rivals in the luxury car market. The first model to be rolled out will be an its first all-electric luxury SUV based on the e-tron Quattro concept car that was revealed last fall at the Frankfurt motor show. Several luxury plug-in hybrids will be released by competitors in the near future, usually variants of existing models from BMW, Cadillac, Hyundai’s Genesis, Infiniti, Mercedes, Porsche, and Volvo. Updated AFLEET tool released: The U.S. Department of Energy’s Argonne National Laboratory has released an updated version of its AFLEET tool to reflect the latest advances in alternative fuels and advanced vehicle technologies and updated emissions data. Sponsored by the DOE Clean Cities program, AFLEET stands for the Alternative Fuel Life-Cycle Environmental and Economic Transportation Tool. The free, publicly-available tool provides users with a roadmap for assessing which types of vehicles and fuels are right for them. The 2016 AFLEET Tool and user guide are available online. Although anyone can download and use the tool, AFLEET was designed for managers that purchase and maintain a fleet of vehicles. Serious injury at Tesla plant: Tesla Motors Inc. is investigating how a worker from Slovenia was critically injured in a fall while on the job at the company’s plant in Fremont, Calif. An article in The Mercury News said Gregor Lesnik fell nearly three stories during the incident last year, breaking both his legs and ribs, tearing ligaments in his knee and giving him a concussion. His job was to lift heavy pipes and install them into the ceiling and through the roof of the plant’s paint shop, according to the article. The newspaper also reported that Lesnick was only making $5 an hour. Tesla said that Lesnik in through a sub-contractor company that only paid him that amount. More energy stored in battery: Proterra, a maker of battery-electric buses in North America, announced a new battery design for the Proterra Catalyst XR transit vehicle at the American Public Transportation Association Bus and Paratransit Conference (APTA). Within the same energy storage footprint as the original Catalyst XR, the battery-enhanced vehicle now holds 28% more energy at 330 kWh and a lightweight vehicle body. All current Catalyst XR customers will receive a complimentary upgrade to the higher energy level. Nissan diesel SUV: South Korea is enforcing a penalty against Nissan Motor Co. including a fine and a recall of its Qashqai diesel sport utility vehicles after accusing the automaker of manipulating emissions. Nissan has denied the allegation. Nissan had blown the whistle on Mitsubishi Motors Corp’s mileage-cheating scandal and last week announced it was buying a $2.2 billion stake in Mitsubishi. South Korea’s environment ministry said it believed Nissan had used a “defeat device” in the Qashqai to turn off its exhaust reduction system under regular driving temperatures and will recall 814 of these vehicles sold so far in the country; with a fine of 330 million won ($279,920). Propane road show: Alliance AutoGas has embarked on a nationwide trip, coast-to-coast, to educate people on propane autogas’ quality technology, clean air, and American fuel. The Oklahoma State Capitol Building was the midway point stop of the Alliance AutoGas Coast-to-Coast Clean Air Ride in Oklahoma City. Central Clean Cities coordinator Eric Pollard, said that the event brought together the propane marketers, fleet managers, equipment providers, and transportation professionals to focus on the air quality and energy security benefits of increased propane use in transportation. At the 2016 NTEA Work Truck Show in Indianapolis, Alliance AutoGas converted an Ford F-150 to run on propane autogas. It was the fastest vehicle conversion to propane autogas in history at only one hour and thirty-two minutes, the company said. Meeting federal standards: Check out a guest editorial by Ben & Jerry’s CEO Jostein Solheim in Trucks.com on the company’s goal to reduce its carbon footprint across the entire business 80% by 2050. Solheim wrote about what it’s like to run a large freight of trucks transporting ice cream products while complying with federal standards and making it all economically viable. Biodiesel fraud: A U.S. District Court judge has sentenced Jack Holden, 76, of Eugene, Oregon, to 87 months in prison, restitution of $1,410,760, and a separate $1,500 fine for his role in a fraudulent biodiesel scheme that spanned three continents. Holden was convicted of conspiracy to commit mail and wire fraud, conspiracy to commit money laundering, mail and wire fraud, and money laundering. His codefendant, Lloyd Benton Sharp, 81, pled guilty to conspiracy to commit mail and wire fraud on Nov. 19, 2014, and was sentenced to 60 months in prison the following spring. EV sales in April: Plug-in hybrids are taking the lead this year, jumping 40 percent in first quarter U.S. sales versus that same period in 2015, according to Edmunds.com. In April, they were up 96.4% over April 2015 and up 9.6% over March 2016. 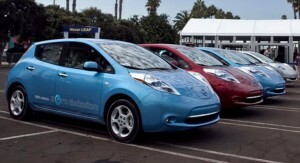 Battery electric vehicles were down nearly 12% from the previous month and were up 3.8% over the previous year according to HybridCars.com and Baum & Associates. At 6,266 units sold, BEVs were still in the lead over PHEVs at 5,842, but the gap is tightening. BEVs had been dominant in the market for the past two years. The Chevrolet Volt and Ford Fusion Energi led the way for PHEVs, and were up 119.1% and 87.2%, respectively, over last year. The Tesla Model S was down 10.5% from last year and the Nissan Leaf was down 49.3% from April 2015. The Leaf finished 6th on the list after the BMW i3; not long ago, it was in the top sales position. The all-electric BMW i3 broke the market trend for this year, doubling its sales since a year ago and going up 145.2% in sales over March 2016. In the top positions, the Volt finished the month with 1,983 units sold, and number two was the Model S, finishing at 1,700 units sold. Tesla Q1 performance: Customer deposits for the $35,000 (or more, depending on options chosen) Model 3 helped Tesla raise cash on hand during the first quarter of 2016 as it reported a wider net loss of $282 million. Revenue rose 22% to $1.1 billion. Struggling to solve quality problems with its first two models while getting ready to launch the all-new Model 3 has been costly for Tesla Motors. It was another deficit for the automaker which has yet to see a profitable quarter, but losses narrowed, taking industry analysts by surprise. Using Tesla’s preference for non-GAAP accounting, the loss shrank to $75 million, or 57 cents a share, which was better than Wall Street had forecast. Analysts and shareholders took even more interest in a dramatic statement from CEO Elon Musk during the quarterly call – the electric carmaker will build 500,000 cars in 2018 and close to one million by 2020, two years ahead of the original schedule. EcoCAR 3: Cal State Los Angele’s EcoCAR 3 team has just shipped its modified 2016 Camaro to General Motors’ testing facility in Yuma, Ariz. That’s where all 16 teams’ cars will be inspected and scored on how far teams were able to progress on hybrid vehicle integration since receiving their Camaros in December 2015. There are two more years to go in EcoCAR 3. It’s the third racing competition from the U.S. Department of Energy (DOE) Advanced Vehicle Technology Competition (AVTC) series. All 16 North American university teams are competing to redesign a Chevrolet Camaro to reduce its environmental impact, while maintaining the muscle and performance expected from this iconic car. Sponsored by DOE and GM and managed by Argonne National Laboratory, the EcoCAR racing series have been excellent training grounds for students in developing hybrid technologies, working effectively on a team, and opening doors for excellent job opportunities in the auto industry. Another legal fight for Uber: Less than a month after ridesharing giant Uber settled two class-action lawsuits in California and Massachusetts, another one has been filed in a federal court. The new lawsuit affects all current and former Uber drivers in the U.S., except for those in California and Massachusetts. The suit, filed last week in federal court in Chicago, asks the court to classify Uber divers as employees rather than independent contractors and other issues similar to the San Francisco case. In another news development, voters in Austin, Texas, have rejected a proposal for loosening regulations affecting Uber and Lyft. Both companies are pulling operations out of the city for now. In late 2015, Austin’s City Council approved an ordinance requiring companies like Uber and Lyft to be regulated like taxis with fingerprinting for background checks. Both ride-hailing companies pushed for a ballot proposal that ended up working against them. 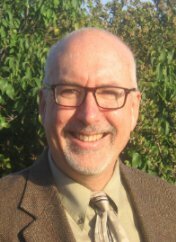 Goodbye, Joe Jobe: Joe Jobe is leaving his position as CEO of National Biodiesel Board after nearly 20 years of service, to pursue other opportunities. The board will be searching for a permanent replacement immediately. Jobe started with NBB in 1997 and was named CEO in 1999. During that time, he helped lead the industry from 200,000 gallons of biodiesel use to over two billion gallons projected in 2016. Biodiesel is being used as a clean fuel by a growing number of fleets for their trucks, as was mentioned last week at ACT Expo. Looking for office space: Apple is looking for 800,000 square feet in the Bay Area to set up its autonomous vehicle and Titan electric car project. Google is looking for 400,000 more square feet for its self-driving car research and development operations. Victor Coleman, a notable San Francisco Bay Area landlord told Wall Street Journal that Apple seeks real estate in the area. He said that Google (Alphabet), and several automakers are actively searching out large real estate spaces as well; the areas may be used for autonomous vehicle development, he said. Networking charging stations: A new Navigant Research study says that communications technologies like RFID and Wi-Fi are one of the main reasons that electric vehicle charging installations are able to spread around the world. Having the right communications systems in place helps EV drivers gain access to charging power and pay for it. Whether it’s free or for a fee, the charging station must be able to communicate consumption data to the site owner or network operator, the study says. Hybrid supercars: As part of its business plan through 2022, more than half its cars will be hybrids, said Mike Flewitt, CEO of British supercar maker McLaren. McLaren will be working with other high-end luxury performance carmakers facing global emissions regulations and upscale car buyers interested in the new technologies, including British carmaker, Bentley, and Chinese EV start-up LeEco. BeeZero fuel cell carsharing: Starting this summer, 50 Hyundai ix35 Fuel Cell cars will be stationed around Munich for short-term rentals using a mobile app. European industrial gas producer Linde will be helping make that a viable possibility by setting up the world’s first hydrogen fuel cell-powered BeeZero carsharing system. Renters can keep the cars as long as they need them, though rates aren’t yet available on the BeeZero website. ACT Expo 2016 reflected a few changes emerging in the clean transportation space – adoption of more electrified vehicles by fleets and freight movers; results of a study detailing the benefits of using renewable natural gas; speaker panels delving into the future of urban mobility and autonomous vehicles; and a revised name for the sixth annual conference and expo. Advanced Clean Transportation (ACT) Expo, formerly known as Alternative Clean Transportation Expo, was held May 2-5 in Long Beach, Calif. The sixth annual event was well attended and its expo hall was filled with displays from vehicle manufacturers and alternative fuel conversion companies, fueling infrastructure suppliers; electric vehicle charging suppliers; and tables staffed by government agencies and NPOs serving the community. The event was co-hosted with the Electric Drive Transportation Association (EDTA), the Propane Education & Research Council (PERC), NGVAmerica, the North American Council for Freight Efficiency (NACFE), and the California Hydrogen Business Council (CHBC). Penske Truck Leasing was the 2016 presenting sponsor. Conversations were filled with discussions of two hot topics coinciding with the event: the California Sustainable Freight Action Plan being released Tuesday in draft form with a two-month comment period. The plan calls for the launch of more than 100,000 zero- and near-zero emissions trucks and other freight-moving equipment throughout the state by 2030. A day later, the state awarded $23.6 million to the South Coast Air Quality Management District (SCAQMD) for a zero-emission drayage truck development and demonstration project. It will bring 43 battery electric and plug-in hybrid drayage trucks to major California ports. The South Coast air district is teaming up with air districts in the Bay Area, Sacramento, San Diego and San Joaquin Valley to roll out demonstration trucks and charging infrastructure for emission reduction benefits in key areas of California with drayage truck activity. California Air Resources Board Vice Chair Sandy Berg and L.A. City Councilman and SCAQMD Board Member Joe Buscaino led a presentation of the award Wednesday afternoon in the ACT Expo hall. On Tuesday morning, event organizer Gladstein Neandross & Associates (GNA) released “Game Changer,” a technical white paper – written on behalf of multiple private and public sector organizations – that explores the need and approaches to start deploying zero-emission and near-zero-emission heavy-duty vehicle technologies on a wide-scale basis in the U.S. The white paper has compared four fuel-technology combinations to address these goals and has concluded that there is only one pathway that meets the commercial feasibility and logistics tests to immediately begin this transformation. This is near-zero-emission heavy-duty natural gas vehicles fueled by increasing volumes of ultra-low-GHG renewable natural gas (RNG). This topic was also part of a speaker panel that morning at ACT Expo featuring SoCalGas president and CEO Dennis Arriola. Read more about the white paper. On Thursday morning, Genevieve Cullen, president of Electric Drive Transportation Association (EDTA), kicked off “Charging Ahead with EVs.” Hybrid electric vehicles, battery electric vehicles (BEVs), plug-in hybrid electric vehicles (PHEVs), and fuel cell vehicles are gaining interest and acquisitions from light-duty fleets; PHEVs and BEVs are starting to see penetration in medium-duty fleets; BEVs are taking off with transit bus fleets; and extended range and hybrid configurations are gaining interest in the market as more technologies roll out, Cullen said. Technology drivers include 50% fuel efficiency gains from hybrid systems, up to 80% with PHEVs, reduced fuel costs and overall operating costs, and measureable emissions reductions, she said. Jedediah Greenfield, public information and sustainability officer for the City of Houston, chaired a panel on automakers and electric vehicles being used in fleets. Jamie Hall, manager of public policy at General Motors, said that the upcoming Chevrolet Bolt is gaining interest from fleets and consumers for its 200-plus charging range and the various applications it offers as a crossover utility vehicle. 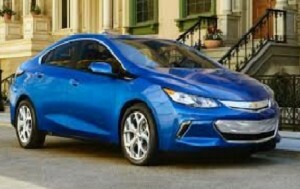 Hall said that battery degradation continues to be an area of concern for EV acquisitions; and that none of the Chevrolet Volt batteries have needed to be replaced. Robert Langford, manager, plug-in electric vehicle sales for American Honda Motor Co., thinks that public charging is a driver of EV adoption that needs more support. Smart locations, available charging, and continued growth in DC fast chargers are needed, he said. Langford also talked about two plug-in versions of the Honda Clarity rolling out, joining the Clarity Fuel Cell. Marc Deutsch, EV business development manager for Nissan North America, said that Nissan is selling a lot of certified pre-owned and used Leafs. Pre-owned Leafs are bringing opportunities to disadvantaged communities. Challenges continue for bringing Leafs and other EVs to multiple-dwelling units along with the needed chargers, Deutsch said. Keynote speaker Andrea Pratt, green fleet and fuel program manager at City of Seattle, explained the total cost of ownership (TCO) model the city has been using in vehicle acquisitions and reporting. Switching over from internal combustion engine vehicles to battery electric vehicles such as the Nissan Leaf has brought big savings to the city – over $2.2 million in operating cost savings by bringing in 150 EVs, she said. It’s been part of the Drive Clean Seattle program transitioning away from fossil fuels in transit and the city fleet, Pratt said. Emily Castor, director of transportation policy at Lyft, spoke on the “Autonomous and Connected Urban Mobility: Tackling Challenges & Opportunities” panel. Castor talked about how its ridesharing now makes up 40% of the rides in 15 U.S. cities testing out the Lyft Lanes ridesharing service. Castor also talked about a short-term lease program Lyft is trying out with General Motors offering Lyft drivers an opportunity to rent a Chevrolet Volt for rides. Sustainability has been built into Lyft’s strategy of providing mobility services in cities, Castor said. Workhorse Group received a good deal of attention during the week. Steve Burns, CEO of the company gave a presentation on Workhorse Group’s medium-duty, battery-electric trucks and fully integrated unmanned aerial delivery drones. At its booth, the company showed a video at its display featuring a small drone launching from the top of a delivery truck, flying a package to a nearby house and returning to the vehicle. There was also a display vehicle in the hall featuring a UPS electric vehicle provided by Workhorse Group. Last year, UPS announced the deployment of 18 electric, zero emission delivery vehicles to the Houston-Galveston area in Texas; and 125 hybrid electric delivery trucks rolling into the fleet in Arizona, Texas, Nevada, Mississippi, Alabama, Georgia, and Florida during the first half of 2016. These electric and hybrid delivery vehicles are being produced by Workhorse Group in collaboration with UPS. During a keynote address, Carlton Rose, president of global fleet maintenance and engineering for UPS, discussed the company’s 6,800 clean vehicles running on CNG, LNG, propane, electric and hydraulic hybrid combinations, and all-electric. Rose called on his colleagues in the audience, especially truck operators and government agencies, to collaborate on investing in the clean technology and fuel, and adopting forward-thinking polices and incentives. Los Angeles Police Department electric display vehicles showcasing BMW i3 and Tesla Model S patrol cars, which were introduced last fall. BYD’s electric bus being used by Long Beach Transit, and medium-duty electric trucks for delivery fleets. 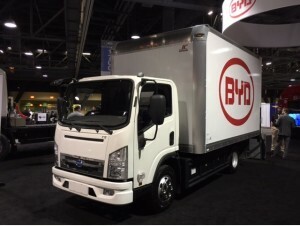 BYD was one of the vehicle manufacturers acknowledged for the SCAQMD zero emission truck grant, along with Kenworth, Peterbilt, and Volvo. Love’s Travel Stops and Trillium CNG unveiled the companies’ new consolidated logo showing a visual representation of how the two companies will continue to serve the market. Love’s recently acquired Trillium CNG, a veteran compressed natural gas company. This will expand the company’s reach across the country and offerings to customers, the company said. ChargePoint unveiled the new CPF25 charging station and upgrades to its Fleet Plan. That announcement coincided with the company raising $50 million from private investors to expand its offerings. ClipperCreek unveiled the HCS Series with ChargeGuard, an affordable access control solution designed for fleet, workplace, multi-tenant, hospitality, and residential charging applications. The California Truck Equipment Company (CTEC), of Downey, Calif., and Rockport Commercial Vehicles, out of Elkhart, Ind., are two of the latest vehicle builders to offer all-electric versions of their existing commercial vehicles using the Motiv All-Electric Powertrain. Motiv said that it will make the Rockport all-electric box truck available for test drives through demonstrations and short-term leases to support fleets in making the decision to add electric vehicles. Spire Natural Gas Fueling Solutions and Mainstay Fuel Technologies, Inc. announced a partnership that will link Spire’s CNG fueling station offerings with Mainstay’s CNG vehicle fuel system expertise to provide “customized” CNG vehicle and fueling station solutions tailored to specific fleet needs; along with competitive pricing both on the road and at the pump, said Peter Stansky, senior vice president and COO of Spire. While the company announced it after ACT Expo, J-W Power Company announced that it has developed a new patent-pending compressed natural gas (CNG) technology, J-W PowerFill Compressor, that significantly improves the customer’s fueling experience with decreased fill time at the dispenser. “If you are planning to build a CNG fueling station, J-W PowerFill Technology increases flow rates without increasing horsepower, significantly increases use of onsite storage, reduces starts and stops on equipment, and ultimately enhances the customer’s fueling experience,” said James Barr, Vice President J-W Power Company. Unilever’s commitment to sustainability throughout their supply chain has grown into CNG for transporting their products to market. The first pilot project with GAIN Clean Fuel took place in Edwardsville, IL, where carriers for Unilever consume over 1 Million gallons of CNG/year moving goods to market. The company has additionally reduced energy consumption in its factories by 20%. Central Freight Lines has been a leader in promoting the use of CNG in the State of Texas. Became one of the first LTL carriers to purchase CNG tractors in 2012. Don Orr has been a visionary who realized the impact of CNG usage in heavy duty trucks and has “walked the talk” with his clean air initiatives. Lowe’s dedicated fleet at Mount Vernon is among the first serving a major retail distribution center in North America to run solely on natural gas. Currently working with carriers to transition all regional distribution center dedicated fleets to natural gas by end of 2017. The company began using natural gas trucks last year at its distribution center in Kissimmee, Fla., and teamed with longtime carrier partner NFI to launch the natural gas dedicated fleet in Texas. Ruan Transportation Management Systems maintains a fleet of approximately 100 compressed natural gas (CNG) tractors. Currently, nearly 50% of their CNG fleet, 42 trucks in total, provides service for the Indiana dairy, Fair Oaks Farms. This is a particularly unique case as the trucks are fueled by renewable CNG produced at the dairy. The methane is created from animal waste in an onsite anaerobic digester and piped to a station where it is compressed for fueling by the fleet. Andrea is an enthusiastic champion for cleaner fuels and has helped position the City of Seattle as one of the most progressive fleets in the region. Seattle was one of the first cities to purchase EVs for a fleet application back in 2011. The City’s motor pool has nearly 80 plug-in electric/electric-hybrid vehicles – the majority of which are dedicated battery electric. She also established a contract with a local biodiesel provider for more favorable rates than what was offered on the state contract. Seattle is now planning one of the largest EV infrastructure projects ever seen in the US, with over 400 charging stations. SuperShuttle has been an early adopter of various alternative fueled vehicles, including a significant amount of CNG and LPG, in various markets. Has been deploying AFVs since 2009. Purchased 130 CNG vans in 2014. Has 160 propane vans nationwide as of 2014. The San Francisco operation is 100% CNG. PG&E operates one of the cleanest fleets in the utility industry. Fleet includes hybrid electric utility trucks, electric bucket trucks, extended-range pickups, and battery electric and plug-in hybrid sedans. The Class 5 utility truck features exportable power capable of supplying 120 kW, which allows the vehicle to be plugged directly into the grid and power up to 100 homes during outages. Bucket trucks have a plug-in battery-powered system called JEMS that operates the auxiliary systems, including the bucket, lights, hydraulic lifts, heating and air conditioning, and tools. Banny Alison has lead AmeriPride in their fleet’s commitment to the environment and the communities where they work. As one of the biggest operators in the textile delivery industry, they are setting the standard for clean operations and continue to make improvements to delivery operations and invest resources to test and help advance new green technologies. They have invested in a variety of alternatively fueled walk-in vans, including those that operate on electricity, propane, compressed natural gas and hybrid drivetrains. The company also invests in efficiency technologies including trailer skirting and doubledecker semi-trailers, fuel efficient sedans for the service team, and the installation of telematics technology and route optimization software to reduce mileage and increase efficiency. UPS has always been an early adopter of innovative technologies. In the early 1930s, they introduced electric vehicles into our fleet. Today, they operate one of the industry’s largest private alternative fuel and advanced technology fleets made up of more than 5,000 low-emissions vehicles. UPS tests and deploys a variety of vehicle types, matched to the terrain and delivery conditions at each location. This approach helps UPS continuously integrate new technologies and operational efficiencies in its large, global delivery fleet. UPS has demonstrated their commitment to the NGV market through their continued acquisition of both heavy and medium duty CNG vehicles. They have additionally deployed electric and ethanol vehicles in vehicles that complete short city trips, propane vehicles in rural areas, and LNG in long-haul applications. Since 2000, their alternative fuel and advanced technology vehicles have logged more than 500 million miles in the U.S., Germany, Canada, Netherlands, Chile, Thailand, Hong Kong, South Korea, Brazil and the United Kingdom. NGVAmerica President Matthew Godlewski honored two recipients with the 2016 NGV Achievement Awards, FCA US LLC and Anheuser-Busch, during the Fleet Awards dinner. FCA, the first to market a factory-built pickup truck powered by compressed natural gas (CNG), the bi-fuel Ram 2500, recently committed approximately $40 million to FCA Transport, an FCA US-owned truck fleet, to convert 179 diesel-fueled parts-haulers to run on clean-burning natural gas at its Detroit Terminal. Annually, this new fleet will displace nearly 3.3 million gallons of diesel fuel and dramatically reduce CO2 emissions. Through its “Seed-To-Sip” sustainability initiative, Anheuser-Busch is committed to reducing the energy and emissions in both the brewing and transportation of their beers. In 2015, its flagship brewery in St. Louis replaced all 97 diesel-fueled tractors with new CNG-powered trucks, following the deployment of 66 CNG trucks in Houston the prior year. GM China Launching EVs: General Motors, along with China-based partner SAIC, plans to launch more than 10 new electrified vehicles in China by 2020, Matt Tsien, president of GM China said. These plug-in hybrids and battery-electric vehicles will be sold by the Chevrolet, Cadillac, and Baojun brands, Tsien said. While luxury vehicles and crossovers are experiencing double-digit gains in an overall soft auto market, EVs hold great potential. Tsien said the Chinese government is promoting greater investment in so-called “new energy” vehicles, the official term for electrified vehicles. He thinks China will be an even larger market than the U.S. for the upcoming Chevrolet Bolt and other EVs. GM China will begin producing a plug-in hybrid version of the Cadillac CT6 later this year; that model will be exported to U.S. dealers. Game changer in trucking: Gladstein Neandross & Associates (GNA) today released “Game Changer,” a technical white paper – written on behalf of multiple private and public sector organizations – that explores the need and approaches to start deploying zero-emission and near-zero-emission heavy-duty vehicle technologies on a wide-scale basis in the U.S. The white paper has compared four fuel-technology combinations to address these goals and has concluded that there is only one pathway that meets the commercial feasibility and logistics tests to immediately begin this transformation. This is near-zero-emission heavy-duty natural gas vehicles fueled by increasing volumes of ultra-low-GHG renewable natural gas (RNG). This topic is also part of a speaker panel this morning at ACT Expo. Read more about the white paper. Range extended BMWs: The next versions of the BMW i3 and i8 will see extended range and power. The i3 electric car in 2017 will have a bigger battery to boost its electric range from 80 to 114 miles. The i3 will have a 50% increase in battery capacity. With its denser lithium ion batteries, the i3 goes from 22 kWh to 33 kWh without physically increasing the size of the battery pack. The BMW i8 will have more horsepower and longer battery range when released in the next year. It will be gaining a more powerful electric motor that would go a little bit faster than its current 0 to 62 mph in 4.4 seconds. It may gain an increase of 50 percent range, just like the i3. The BMW i3 is due to roll out later this year in dealer showrooms as a 2017 model. The revised i8 isn’t expected to reach showrooms until next year. DOE offering $22.3 million in funding: The U.S. Department of Energy will issue a $22.3 million funding opportunity for vehicle technologies including medium- and heavy-duty plug-in electric vehicles (PEVs); direct injection propane engines; and alternative fuel vehicle community partner projects. Applications and questions are not currently being accepted. It is anticipated that this Funding Opportunity Announcement will be posted to the EERE Exchange website in June 2016. Resources for multi-unit dwelling charging: The California Plug-in Electric Vehicle Collaborative (PEVC) has been compiling and collecting case studies for the past four years on completed multi-unit dwelling (MuD) vehicle charging in California to publish on the PEVC website. These are being made available to all to illustrate the spectrum of approaches that can be taken to achieve vehicle charging in these communities. Examples of past case studies are available on this site. You can also access the MuD Guide, MuD Survey Form, and other resources that have been put together and will be expanding. You can also register to view the webinar “emPower the People: EV Charging for Apartment & Condo Residents,” from Plug In America. It’s scheduled to take place on Wednesday, May 25, 2016 from 12:00 p.m. to 1:00 p.m. PDT. The program features the “emPower the People Toolkit” (em = electric mobility). The toolkit has been designed to help guide residents in organizing and requesting vehicle charging in their communities. Best SUV fuel economy: The Toyota RAV4 Hybrid has been rated by Consumer Reports as having the best overall fuel economy of any SUV that doesn’t plug in. It came in at 31 mpg in the tests, with 26 mpg city and 36 mpg highway, which is better than most midsized sedans. The standard engine is a 176-hp, 2.5-liter four-cylinder that drives through a six-speed automatic transmission. The RAV4 Hybrid surges ahead of the previous mileage champs, the Lexus NX 300h and Lexus RX 450h with their 29 mpg overall. 500K gallons of RNG: Fred Meyer Stores, a division of The Kroger Co., formed an agreement with Clean Energy for up to 500,000 gallons of Redeem renewable natural gas (RNG) fuel for its fleet of 40 LNG trucks based out of its Clackamas, Ore., distribution center. Fred Meyer is the first company in the State of Oregon to take advantage of the Oregon Clean Fuel Program, which calls for the reduction of greenhouse gas (GHG) emissions through the use of cleaner fuels such as natural gas and renewable natural gas, according to Clean Energy. Fleet charging: ChargePoint is today unveiling the new CPF25 charging station and upgrades to its Fleet Plan at the 2016 ACT Expo. The CPF25 station is a fully networked, 32 amp, Level 2 charging station with design features that include an RFID card/smartphone reader for authentication, robust Wi-Fi, and an easy-to-mount, compact case rated for indoor or outdoor use. It comes in 18 and 23 foot cable options with a standard J1772 connector that can plug into to any EV. ChargePoint has optional mounting accessories that support wall or pedestal installations with optional cable management. Fleets, freight and logistics companies, and urban transportation planners are looking at best practices for hitting targets in greenhouse gas emissions, air pollution, fuel consumption, and mobility in crowded cities. That will be a discussion topic this week at ACT Expo in Long Beach during corporate sustainability speaker panels. The plan will include an implementation strategy for deploying over 100,000 freight vehicles capable of zero-emission or near-zero-emission operation by 2030 aimed at meeting the state’s air quality and climate protection goals. It comes from a collaboration with the California Department of Transportation, the California Air Resources Board, the California Energy Commission, and the Governor’s Office of Business and Economic Development. The draft Sustainable Freight Action Plan was scheduled to be released to the public on Friday, April 29. The anticipated plan is sure to be a key discussion topic at ACT Expo, Neadross said. Fleets and freight transport companies can reduce road transport carbon emissions 29% in 2030 by deploying a clean transportation strategy, according a Lux Research Study. The sharp cut – exceeding the target of 24% set by 188 nations at the Paris Conference of the Parties (COP21) in 2015 – will be realized from a combination of low-carbon fuels, alternative fuel vehicles, and improved fuel efficiencies; biofuels and natural gas vehicles together will account for 45% of potential fossil fuel displacement as nations look for new technologies to cut emissions, Lux Research says. Biofuels recommended for use to hit these targets include cellulosic ethanol, renewable diesel and biomethane (renewable natural gas). These fuels, “have lower well-to-wheel carbon intensities compared to their first-generation counterparts and play a pivotal role in cutting emissions, as does renewable electricity,” said Yuan-Sheng Yu, Lux Research Analyst and lead author of the report. Without improved fuel efficiencies, emissions reduction falls short of the COP21 target in 2030 by nearly 5%. Automakers will have a range of lightweight materials available as multinationals and start-ups develop the next-generations of steel, aluminum, and composite technologies, Lux Research says. Corporate sustainability policies have pushed fleets and logistics operations in this direction. Walmart has set a goal to double its fleet efficiency compared to 2005, and is 87% of the way to meeting this target. General Mills has cut its fuel consumption 22% compared to 2005 levels. DHL has improved the carbon efficiency of its business activities by 25% compared to 2007. The company recently added nearly 1,000 electric vehicles to its fleet, bringing that total to more than 13,500 in use network wide. UPS is growing its alternative-fuel vehicle fleet every year and improving efficiency with its proprietary routing software ORION (On-Road Integrated Optimization and Navigation). The company’s “green fleet” is comprised of about 6,840 vehicles, or about 7 percent of its total feet, and includes propane, compressed natural gas, liquefied natural gas, and hybrid and electric vehicles. Employers are working with city planners and transportation agencies to help deal with traffic congestion, air pollution, and to reduce stress for the local workforce. Susan Shaheen, a researcher at the Transportation Sustainability Research Center of the University of California, Berkeley, says ridesharing carpool services are a solution being explored that could help fix some of the “first-mile, last-mile” issues with U.S. transportation grids. In Late March 2016, Lyft launched Lyft Carpool, a pilot program in the San Francisco metro area. The focus has been to address a heavily congested section of Highway 101 between San Francisco and Silicon Valley. The program matches up commuters for carpool rides. Commuters would pay through mobile apps and the services would take a percentage of the money charged. Lyft also is working with the regional Metropolitan Transportation Commission to expand carpool lanes along that route, said Emily Castor, director of transportation policy for Lyft. The company also is working with transportation agencies in Nashville, Los Angeles, Dallas, Denver, and other cities to provide more connections from homes to mass transit. This test program and other carpooling and ridesharing services are gaining traction and interest with public transportation planners. A recent study by the American Public Transportation Association suggests that ridesharing trips using Uber and Lyft are replacing trips made with personal vehicles more than trips using public transport. The report recommended that public-transit officials start working on ways to make ridesharing part of their services.